Sadly I will miss this again as supporting the Iceni weekend which is on at the same time. Must remember next year to leave more in the bank account in January to pay for all the trips. Hi Chris is there a link to an entry form ? Age. YOU need to email your request. This fills up fast so I wouldn't hang around. We still have some spaces remaining on our popular Axe to Exe weekend, 22nd and 23rd April 2017. 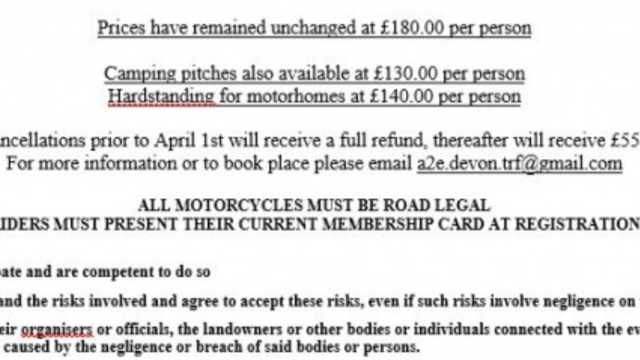 Come and ride the amazing Devon lanes. email a2e.devon.trf@gmail.com for your entry forms and more information. We look forward to welcoming you to Devon. Well it certainly was an excellent weekend! You are spoilt in Devon. Thanks for all the hard work and enthusiasm from the Devon TRF. I'll be back next year. A big thank you too everyone involved in this weekends event. My first time but I will be back. Great accommodation and riding and a special thanks to Sean for showing me around for both days. well done to everyone for a really well organised event.